In 1918, Clinton Melville Tilman Brann, a dentist by training, served with in the 17th Field Artillery of the American Expeditionary Forces in France, a unit cited for gallantry in five critical engagements of the First World War. During his time overseas, Brann maintained an intense correspondence with Rhea Oppenheimer, despite fears that their different religious (he Presbyterian, she Jewish) and family backgrounds would prove an obstacle. After demobilization, Brann returned home and on Sept. 17, 1919, married Rhea. He went on to build a successful practice in dentistry in Iowa, raising a son and daughter. Clinton Brann passed away on Sept 8, 1961, in Orlando, Fla., with Rhea following on December 29, 1987 in Winter Park, Fla. In two regards, the Brann collection presents an unusual glimpse into families affected by the First World War. First, Brann's letters home offer a sense of his unusual role in the service, as a junior officer and dentist, and second, his letters are marked by his unusual relationship with Rhea Oppenheimer and their concerns over the future prospects for a mixed marriage. The collection also includes a wealth of photographs of the Branns' life together, a family scrapbook, and a handful of mementoes and miscellaneous documents. 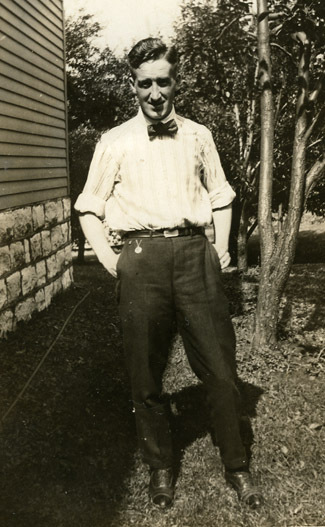 Born in Knoxville, Iowa, in 1891, Clinton Brann was building a career as a dentist when he was drafted into the 17th Field Artillery of the American Expeditionary Forces in 1917. Deployed to France in the spring 1918, leaving behind his fiancée, Brann provided dental care to front line troops during several of the major campaigns of that year, including the Aisne, Aisne-Marne, St. Mihiel, Meuse-Argonne, and Lorraine offensives, spending some time in the trenches himself, earning himself promotion to Captain and an appointment in the Army Dental Corps. For seven months after the Armistice, his regiment remained in Europe as part of the occupation forces, and it was not until the early summer 1919 that Capt. Brann finally returned home to resume his increasingly complicated life. While overseas, Brann began seriously courting a second woman, Rhea Oppenheimer. Although the two fretted constantly how their families would react to the prospect of a mixed marriage -- he was Presbyterian, she was Jewish -- and worried whether they could ever have a future together, they persisted. By October 1918, their epistolary relationship had grown to the point that Clinton broke off his prior engagement and the couple pressed their families to approve of their plans to marry. When announcing his intentions to his mother, Brann explained that any objections "will do no good whatever," while Rhea took pains to ease tensions with her future mother-in-law, confessing her love for Clinton. Their tactics seem to have worked. Martha Brann replied to say that she had no objection to their union, assuring Rhea she would "make a great Presbyterian," and three months after Brann returned home in the summer 1919, the couple wed with the blessings of both families. Brann went on to become a successful dentist, eventually becoming President of the Iowa State Dental Society in 1940. At the outbreak of the Second World War, he returned to active duty with the Army, finally retiring in 1948 with the rank of Colonel. The Branns had two children, Barbara (born March 19, 1922) and Vincent born Feb. 19, 1927). Clinton Brann died in 1961 at the age of 70, and was survived by Rhea by twenty-six years. Brann's letters to Rhea while in France (hers to him have not survived) are peppered with personal anecdotes and veiled news, but above all with a young man's desire to return home to see his love. The anguish both felt over what they perceived to be the futility of pursuing a relationship is palpable throughout, as is their deep longing for one another. Clinton Brann wrote regularly to his wife while serving with the 17th Field Artillery during the First World War, and it appears that Rhea saved most, if not all, of his correspondence. His letters were filled with passionate longing, humorous asides, and good-natured teasing (Clinton seemed to especially enjoy teasing Rhea about all of the French and American girls he met while stationed near the Front), though he occasionally ventures into deeper reflections on the war. His letters provide a small window into what life was like for a junior medical (dental) officer, a very different experience than for many men on the Front, and insight into a time when a difference in creed was considered a significant obstacle. Items collected by Rhea Brann, representing artifacts of forty years of her life before and after marriage. The items include an address book, class yearbook, the register from Clinton's memorial service, and materials relating to their wedding. Materials relating to Clinton Brann's military service and career in dentistry, as well as genealogical information. Also included are a few mementoes collected by Brann, including an Iron Cross brought home from the war. The photographs in Series 4 are organized in two distinct groups. First is the "Early Marriage Album", which document Clinton and Rhea Brann's life together before approximately 1940. These include family photographs and a few pictures taken in Europe during the First World War. The second set of images, mostly snapshots, document the Branns' life after 1940. Also included is a series of postcards sent home from France during the war, and a few photographs from the 1990s, documenting the family home and the graves of Clinton's parents. An oversized bound volume, Rhea's scrapbook contains a typically wide variety of items, including photographs, newspaper clippings, and other small keepsakes. Among other items is a commencement program for Brann's daughter, Barbara, when she graduated from Grinnell College in 1944. Among the recipients of an honorary degree that day was Senator, soon to be Vice President, Harry S. Truman. The Clinton Brann collection was donated by Melvin B. Carlson along with the papers of Clinton's son, Vincent. Since there was a considerable amount of material pertaining to both Clinton and Rhea that covered very different ground, the material was split into two separate collections. The World War I correspondence and other materials have been digitized and may be viewed online through SCUA's digital repository, Credo. Processed by Micah Schneider, March 2009. See also the papers of Vincent Brann (FS 094), Clinton's son and a Professor of Theater at UMass Amherst. Digitization was made possible through the generous support of the Neal Shipley Fund and Lloyd Bonfield. Cite as: Clinton T. Brann Papers (MS 594). Special Collections and University Archives, University of Massachusetts Amherst Libraries. United States. Army--American Expeditionary Force.